News of the almost 50-car pileup, including a semi going up in flames, in Indianapolis at the beginning of the year became top news. As often seen in multi-car accidents, the calamity began with poor weather conditions, including heavy snow and icy roads. The highway remained closed for almost 30 hours as emergency crews worked to remove the vehicles, which piled up like dominoes. Luckily, only about 20 were injured, and no one died, which is often not the cause when several cars collide. In Brooklyn, we see many auto accidents involving single and multiple vehicles. 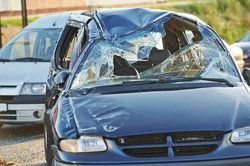 The profile of an auto accident involving one car or truck versus an accident with several parties involved tends to have different causes and profiles. Operator error is the most common officially listed cause of an accident involving a person plowing through a store window, jumping a curb and landing in the median, or simply running off the road. Mechanical defects, like brakes failing, can also cause single vehicle accidents. Single-vehicle collisions, as the name suggests, include only one car or truck. This category includes rollovers, accidents in which a car runs off the road, and a driver hitting a tree or animal. The term typically references accidents where only the driver and/or passenger sustain any personal injury. Not surprisingly, many such auto accidents result from alcohol or drug-impaired driving. Speeding plays a significant role as well. Young drivers, common participants in both types of accidents, endure more injuries than older drivers, because young drivers tend to hit the gas pedal harder and more frequently. As auto accident attorneys, we see many accidents that occur simply because a driver exceeded the speed limit. This year, we’ve already seen more than our fair share of pile-ups, the nickname for traffic accidents involving multiple vehicles, in part because of particularly heavy winter storms that created slick roads. In February, 30 people sustained injuries from two crashes involving about 100 vehicles in Wisconsin. Last month in Denver, a pile-up on Interstate 30 wrecked 104 cars and trucks and sent 30 people to the hospital. Again, bad weather conditions were the cause. Notice that these examples happened on highways. That’s typical, as such accidents commonly occur on high-speed, high-capacity roadways. When one car slams on the brakes, coming to a sudden stop, drivers behind the vehicle often can’t stop their cars in time to avoid impact. This is especially true for heavier vehicles, like semi-trailer trucks, and in some cases, the pileups can become quite significant. Poor visibility and erratic driving can play a role in multi-car accidents, as well. In fact, investigators often fail to pinpoint one exact cause of an auto crash, which makes assigning blame or negligence difficult. Unlike running a single car off the road, when multiple cars crash, the likelihood of life-ending injuries increases. Drivers and passengers may fail to escape a crumpled car, or they sustain several blows from different vehicles. The destruction escalates with the addition of fire and toxic chemicals from flammable materials and gasoline. The personal injury attorneys at the Law Office of Gary A. Zucker & Associates, P.C., will assist you with recovering damages and medical expenses after a car accident. Contact our law office today to schedule a consultation.